Sure, the views of New York City from the Top of the Rock and One World Observatory are phenomenal, but there are so many other really fantastic viewpoints of “the city that never sleeps”. Best of all, these viewpoints are free. Check out my Favorite Free New York City Views list on Google Maps video below see exactly what I’m talking about. Then, read on to learn more about what makes these places so special. The Staten Island Ferry links the borough of Staten Island to the borough of Manhattan. These remarkable orange boats run 24 hours a day, 7 days a week. The ferry service began 1817 and is now a wildly popular way for islanders to commute to work. In fact, around 65,000 passengers make this 25 minute journey each day, making this one of the busiest ferry routes in America. 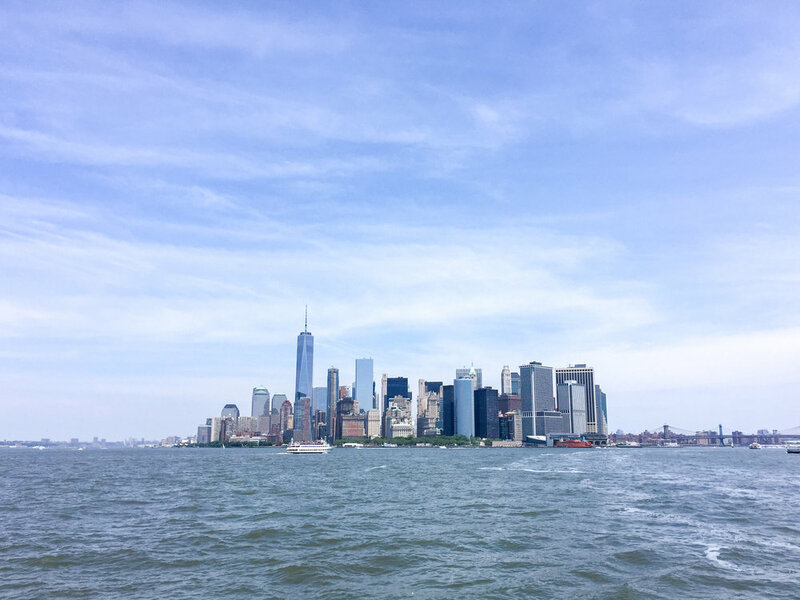 If you want to explore more on the Staten Island side after your ferry ride, I recommend taking the State Island Railway, which connects to the St. George ferry terminal, to Lee’s Tavern. Though it looks like a basic neighborhood pub, their unique style of thin crust pizza is the real draw. The Staten Island Ferry has a little snack shop on board where you can purchase a beer. It’s a great way to toast the sunset and another great day sightseeing in NYC. The Brooklyn Bridge is one of the oldest bridges in the United States of America. Building began in 1869 and took 14 years. After it opened, many were afraid to make the crossing for fear of the structure collapsing. Famous circus man P.T. Barnum came up with an incredible idea for a publicity stunt to prove the bridges sturdiness. He led 21 elephants (among other animals) across the bridge in an effort to promote his museum and show. In 1964, the bridge was named a National Historic Landmark. The Brooklyn Heights Promenade is one of my favorite places to sit and read on a nice sunny day in Brooklyn. The noise of the Brooklyn Queens Expressway below is drowned out once you lose yourself in a good book. After taking in the view, make a detour to the parks and playing fields at the numbered piers at the ground level, below the escarpment the promenade is situated on. New Jersey’s waterfront is just one stop away on the PATH train from the World Trade Center station in Lower Manhattan. A short walk from Exchange Place station, J Owen Grundy Park is a great jumping off point from which to start your exploration of the neighborhoods Hoboken and Jersey City.